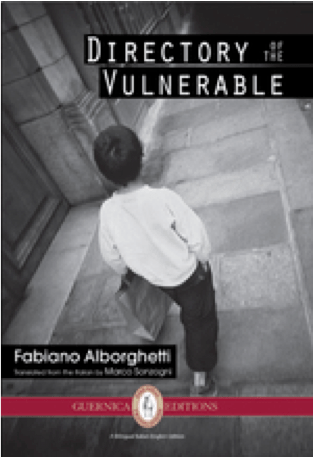 In a recent article for Rain Taxi, Graziano Krätli reviews Fabiano Alborghetti’s Directory of the Vulnerable, translated by Marco Sonzogni. He begins by stating, “Fabiano Alborghetti’s two fine collections to date, L’opposta riva (The Opposite Shore, 2006 and 2013) and Registro dei fragile. 43 canti (2009; Directory of the Vulnerable) represent almost an anomaly, if not a challenge, in the world of contemporary Italian poetry. The anomaly consists largely in the poet’s adoption of a voice (or voices) other than his own, in the process divesting himself of his poetic persona to invest in the cultural and linguistic expropriations (and reappropriations) that such borrowed voices represent, whether they belong to the tattered margins or the dead center of society”. Krätli explains that Directory of the Vulnerable draws on a real-life murder case, which occurred in Italy, 2006. Turning his attention away from the issues of immigration that were the focus of his previous book, L’opposta riva, Directory of the Vulnerable focuses on Alborghetti’s “own fellow citizens, the affluent and alienated suburban middle class to whom aliens (legal or illegal) are but another docu-soap they watch on television…he followed them ‘in the shopping centres, the boutiques, the restaurants…spied on them among the stalls of a market or [from] behind the hedges of private gardens, listening and taking notes.’ These field notes allowed him to insinuate himself imaginatively in the private lives and minds of his two protagonists, and to ventriloquize their growing estrangement from each other”. One of these protagonists is “a woman trapped in a dead-end marriage [who] kills her young and only son, whose birth had ended her dream of becoming a fashion model”. As Krätli explains, “what interests Alborghetti is neither the reality of the facts nor the probability of their causes, but the complex universe represented by the inner and outer lives of his protagonists, the husband and wife whose ambitions, expectations, frustrations, and obsessions are typical of a late capitalist society driven by hyper-consumerism, self-gratification, and celebrity worship”. Fabiano Alborghetti is the author of Verso Buda, L’opposta riva, Registro dei fragile, 43 Canti as well as numerous limited editions and plaquettes. He has represented Canton Ticino, the Italian-speaking region of Switzerland where he lives, at literary festivals and cultural events worldwide. Marco Sonzogni is Senior Lecturer in Italian at Victoria University of Wellington, New Zealand. He has been the recipient of several translation awards, including the Looren Translation Grant and the Pro Helvetia Translation Grant. Tagged with Directory of the Vulnerable, Fabiano Alborghetti, Graziano Kratli, Rain Taxi.